We had a Groupon to Square 1 Burgers that was about to expire – so Saturday night we headed there for dinner. 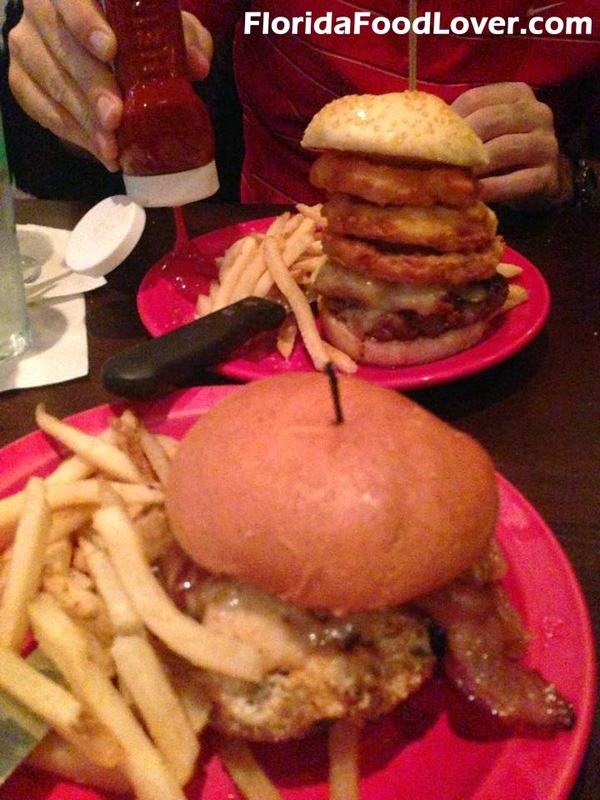 We both had really light lunches at work, so we had plenty of room for their huge burgers. The parking lot there is way too small, so cars were scattered all around the grass and nearby street. We thought with the parking being filled it would be a long wait, but we were actually seated right down in a booth. The décor is a little over the top for me – there is a little too much red in their design (my photos don’t show it as well as in person, but there are red booths, walls, napkins – a little too much…). The pendant lights above their bar need to be updated – they look like they’d belong in a tea cottage rather than a burger restaurant. I do like the funky cow art and the metal “awesome” sign outside though. And if the weather is cooler, their patio area is pretty. They have a nice variety of burgers loaded up with toppings. It’s not the place to come if you’re planning to eat healthy. Last time we came (about a year ago), I got a burger topped with a fried egg, and Lance had a burger stacked so high with thick onion rings that it was impossible to hold. This time, I got the SOB (South of the Border) burger. It had blackened Meyer’s red Angus beef, pepper jack, black bean and corn salsa, jalapenos, avocados, and Fritos topped with their spicy Sooner sauce on a sesame bun. Our waitress sold me on their green bean fries, so I got those instead of normal French fries. She also tried to upsell me on the Kobe beef, but I just stuck with the Angus. Lance had the Bleu Bacon burger – applewood smoked bacon, bleu cheese crumbled, curly leaf lettuce, red onion, and beefsteak tomato on a whole wheat bun. Wow mine was spicy! Although for someone who eats spicy food frequently, it would probably be fine. It was a bit messy with the sauce was dripping out as I ate. The Sooner sauce had a kick to it (it was both on my burger and served with my green bean fries). I actually took a few jalapenos off since I went through 2 waters while eating my meal. The flavor was great, but a little undercooked for me (I asked for medium). Lance’s burger was awesome. The bacon was thick and crunchy, and they were generous with the bleu cheese. His French fries weren’t anything too memorable, but they were very good dipped in my spicy Sooner sauce. The burgers are above average I’d say, but not the best burger in Tampa. It’s definitely worth going to with a Groupon, but we usually don’t eat there much otherwise. So many places nowadays make burgers (and many of them do creative toppings) that there is just too much competition. Square 1 Burgers is located at 3701 Henderson Blvd, Tampa, FL 33609 and is open 11am – 10pm Sunday through Thursday and 11am – 11pm Friday and Saturday.